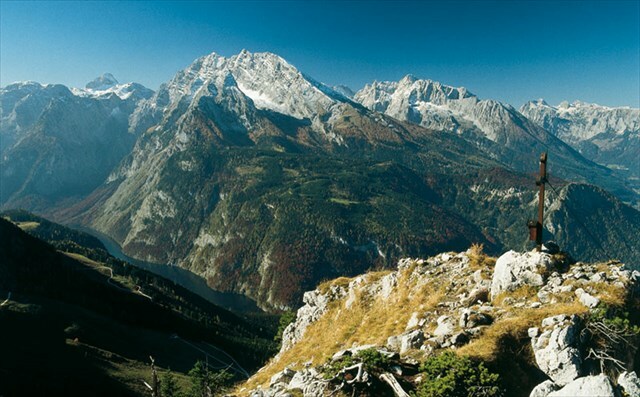 We have put together an amazing deal for a one week trip trekking in the European Alps. More specifically we will be heading to the Berchtesgaden Alps in Southern Bavaria in Germany, on the border with Austria. The trek we will be doing is referred to as the Sea of Stone as we are surrounded by limestone peaks throughout. This hike never goes over 3,000 meters so there is no need to worry about altitude sickness or acclimatization. This hike is not technical from hut to hut, but there are optional summit hikes most days that may include some rock scrambling. We will start and end our hike in Salzburg, a classic Medieval city with old breweries, beer gardens, and castles. You'll have a total of 1.5 days on this trip to explore the city, which was also the home of Mozart. July 7 (Sat) - Depending on flight availability you can either depart from Haneda at 12:01 a.m. and arrive in Munich in the early afternoon and enjoy the city. If you choose this option, transport to central Munich and lodging are not included, but we will help you with logistics. The other option is to depart from Narita at 5:55 p.m. and arrive in Munich at 7 a.m. on Sunday. July 8 (Sun) - ​ 7:30 a.m. - Pickup people arriving on Ethiad flight, and meet in Munich with whole group for breakfast before heading to Salzburg. The drive to Salzburg will take approximately 2 hours with some possible sightseeing along the way as we travel through the mountains. 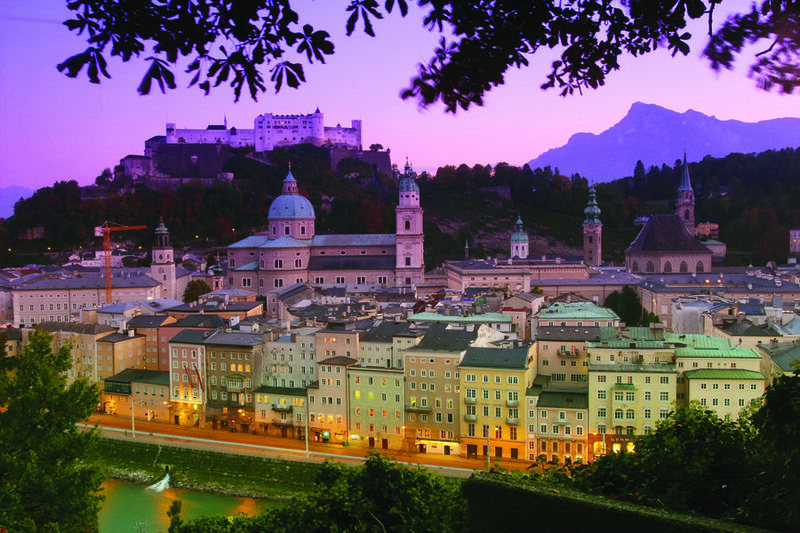 We will spend the day exploring and eating our way through Salzburg's stone cobbled streets. Sites include the Hohensalzburg Castle, Nonnberg Abby built in 1009, Salzburg Cathedral from the 1600's and other sites. We have reserved private rooms for our group at The Kolpinghaus Salzburg, just 10 minutes from the center of the city. This day involves just over 1,000 meters of elevation gain, but it is gentle and steady, so a great way to get started on our trek in the Alps. The hike starts out at Knigssee lake, and then heads up through the Königsbach forest. The hike passes into the alpine zone going through pastures filled with cows and wild flowers. After arriving at the hut there will be on optional ascent of the Pfaffenkegel peak which has a rocky summit with 360 degree views and cross marking the top. This day will have more descent than climbing, but total gain is still over 1,000 meters for the day. From our hut, we start with a gentle ascent up to the summit of Schneibstein a rounded peak surrounded by peaks that resemble the Dolomites in the near distance. Much of this hike is spent in the Alpine zone with 360 degree vies throughout. Towards the end of the day we drop into the Trog Valley which is an impressive landscape. Ibex are often spotted on this section of the hike. This is relatively easy day with only a gentle 800 meters gained. The main feature of the hike to Karlingerhaus is 2 alpine lakes, one of which is just next to the hut offering a great opportunity to cool off in the summer sun with an alpine lake swim. Because of the short hiking time this day, we will have plenty of time for a more extensive day hike from the hut with many options available. 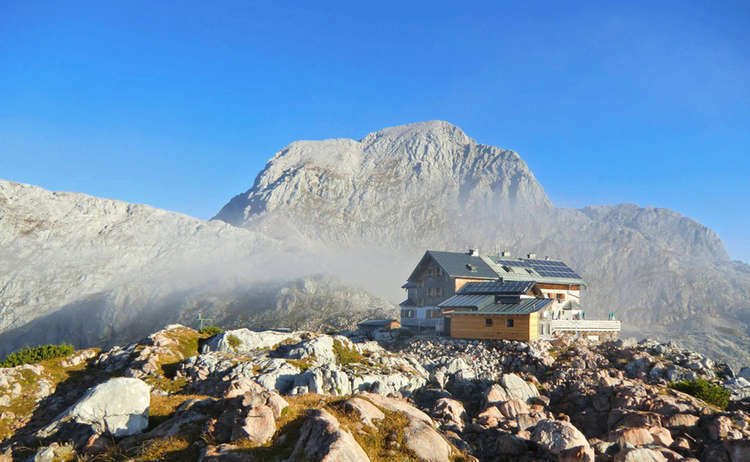 There are multiple peaks surrounding the hut including Funtenseetauern, a 2,579 meter peak on the border with Austria. This day will be spent completely in the Alpine Zone above the trees. You will certainly understand why this hike is called the Stone Sea. There are many opportunities to spot fossils in the old limestone along the upper ridges. 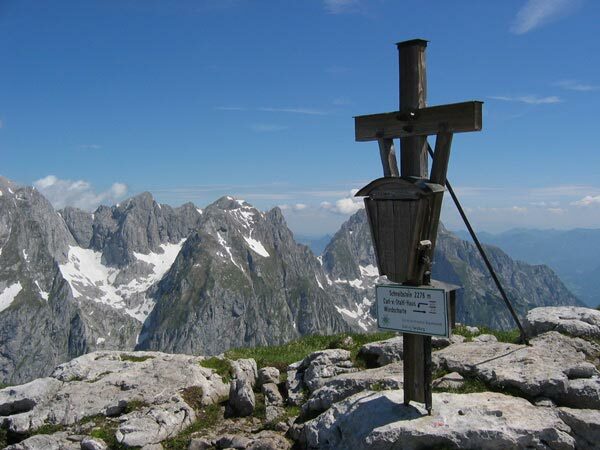 The hike will also take us over the Äulhöhe, a peak of 2,309 meters. This is a pretty big day, but if anyone still has energy there are other peaks to bag from the hut. The hut is situated up a high mountain ridge surrounded by Alpine peaks and has an amazing sunset! On our final day of trekking the path leads down through the undulating high valley of the so-called Hundstodgruben to Trischübelsattel. After a short steep descent, the gently sloping Wimbachtal, covered with a scree over several hundred meters thick. Passing two managed huts, we will end the trek at the Wimbach Bridge at the northern end of the Wimbachtal valley. After finishing the trek, we'll head back to Salzburg and check in to our guesthouse and get cleaned up and enjoy our last night in the city with great food and beer. We will need to leave early to make sure we get everyone back to Munich in time for their flights. We will adjust this days schedules based on flight schedules and make sure to get anyone leaving on Saturday. You will have the choice of either booking Etihad or Qatar airways as long as there is still seat availability. The Qatar flight is around 6,500 yen more expensive but you will be able to spend nearly a full day in Munich on Saturday leaving Friday night from Haneda. 12:45 p.m. Arrive Munich - This will give you a day to explore Munich, but lodging and transport from the airport is not included. These costs are not very high and we will help you arrange things. We expect many people to arrive early to take advantage of this schedule. *You are also welcome to arrive on an earlier day or depart at a later day if you wish to explore more in the area before coming back to Japan. If you would like an alternative schedule then we request that you purchase your own ticket and request a 30,000 yen deposit for the trip. **If you opt to purchase your own flight, then the participation fee is 81,500 yen plus tax. The listed trip price is only guaranteed until 2/20 when the price may change depending on airline costs. If you are booking after 2/20 we will let you know if there are any changes in cost. Mountain Huts: Mountain huts in the Alps are very comfortable, and you can expect to have a lot more space than you would in a Japanese mountain hut. Prices for food are very reasonable and it is all super tasty. Local beers cost 3~5 euros for 500ML, and many of the huts are also equipped with coin showers. You will need to have a sleeping bag liner or cotton sleep sack for staying in the huts though. Any cancellations less than 30 days before the departure date will be subject to a 100% cancellation fee minus any refund provided by the airline which we will return to you. 60 days before the departure date will be subject to a 50% cancellation fee minus any airline refund. Any cancellations of more than 60 days will only be subject to airline fees. For cancellations with Etihad, you would receive the flight value minus 30,000 yen. ・Required Equipment: Trekking boots, rain jacket and pants, warm layers, 35L backpack, headlight, 2L water, light crampons 6~8 points, and money to purchase food on the trail.